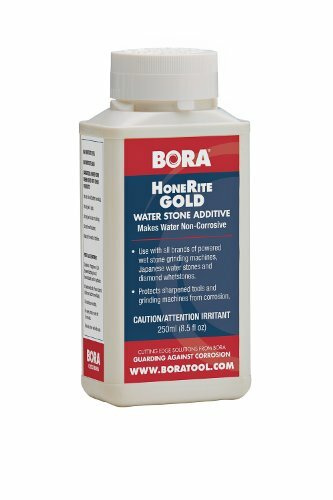 HoneRite Gold is a universal grinding, honing and lapping additive that makes water non-corrosive. That’s correct – the water you use when grinding and or sharpening can be made non-corrosive, which protects everything - the sharpening machine, whatever you are working on, and whatever is nearby that gets splashed. It’s truly a revelation, and why it was given a five-star rating and named gadget of the month in Good Woodworking Magazine (October 2008, Issue # 205.) Ideal for protecting Plane Irons, Chisels, Knifes and other tools when sharpening with water stones. But it doesn’t end there - HoneRite Gold not only makes the water you use non-corrosive, it also can be used on its own to protect metal against corrosion. After you quickly dry off whatever you were working on, give it a wipe with a cloth dampened by HoneRite Gold to give another layer of anti-corrosion protection. Highly concentrated, you can add 40ml to 960ml of ordinary tap water to make a full liter of anti-corrosive honing solution. So your 250ML bottle goes a long way. Pick one up for your shop today so you always have it around. Just add HoneRite Gold to water to make it non-corrosive. Suitable for all water stones, Japanese water stones, ceramic stones, lapping and diamond film sharpening systems. Works with water cooled sharpening systems such as Tormek. This powerful honing/sharpening/lapping fluid contains ferrous and non-ferrous metal corrosion inhibitors, further protecting your tools and machines against rust and corrosion. Add 40ml of HoneRite Gold to 960 ml of tap water to make 1 liter of honing solution / grinding solution. 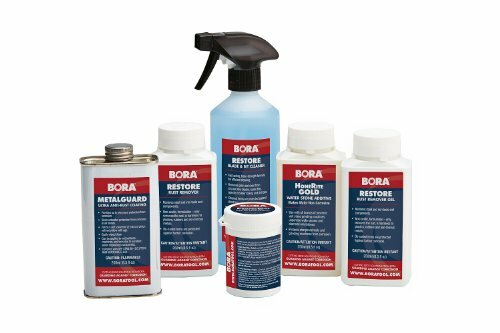 If you have any questions about this product by Bora, contact us by completing and submitting the form below. If you are looking for a specif part number, please include it with your message.